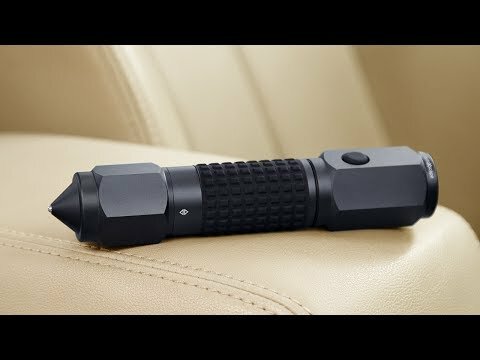 A flashlight is a must-have car emergency tool, and this one is durably built to last a lifetime—and can function in different ways. It works as a wide-angle utility light, or you can set it to red strobes in an emergency. The military-grade aluminum design has a magnetic base, too, to secure it right where you need it. Magnet grade and pull force: N35; 16 lbs. Dimensions: 9.7" x 1.2" x 1.2"
Gave it to my husband to keep in his car! Car emergency tools are a must-have for any motorist. The multi-tools from INGEAR are Made for a Lifetime—and backed by a guarantee—to be the last ones you buy. With the autoXscape and autoAlert tools, your preparedness for serious situations is covered. autoXscape is made from military-grade aluminum with two built-in steel window punches that can break a side window and an integrated seat belt cutter. A high-powered flashlight that can function as a SOS signal rounds out the sturdy, waterproof tool. And it comes with a mount for handy access anywhere inside a car, too. 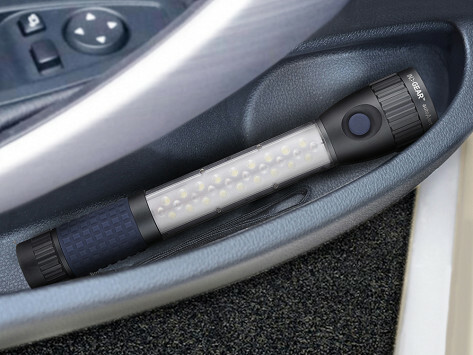 The autoAlert is a high-powered flashlight. It can lend a hand during a roadside emergency, work as a flashlight, or function as an emergency strobe light. Or use it as a wide-angle work light to brighten up routine repairs. It stays put thanks to a strong magnetic base. With these tools on hand or stowed in the trunk, you can feel confidently prepared for situations both serious and routine.